Looking for the Mini Me Baby Gear giveaway? Scroll down or click here? My husband wanted a new bow tie. And there weren’t any at the store. At least not at the department stores we went to at the mall. So we improvised. And turned a neck tie into a bow tie. With a simple velcro closure, using the skinny end of the tie. Perfect for my husband who just wanted a simple little bow tie. My husband is in PA school (physician assistant) and some of the guys in his program all wanted bow ties to wear with their white coats every Friday, while at the hospital. Maybe a regular tie is just no fun anymore? I have no clue. I guess it’s one of those “don’t-ask-why” guy things. Don’t mess with that. Would you like to make a bow tie of your own? Or even alter it for your little boy? First, this works best with the wider ties…..not the narrow skinny ties. (But it doesn’t have to be a super wide polyester tie either.) I first measured a 5 1/2 inch wide section towards the end of the tie…….leaving enough room at the end to fold under and meet back at the middle of the bow tie. Place a pin at each edge of the 5 1/2 inches. Then make folds where your pins are at and tuck the ends behind…. 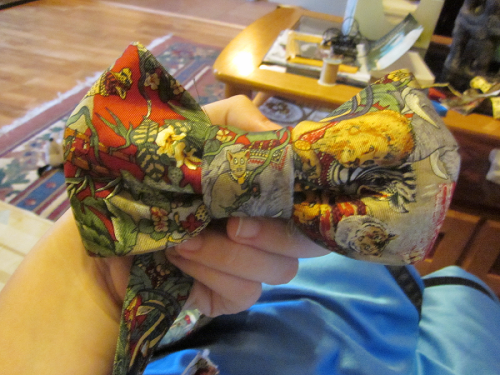 Turn it over, with the folds and pins still in place and cut off the excess length of the tie. But make sure and leave enough so that the raw edge can be tucked under a 1/2 inch. Then hold up your soon-to-be bow tie and see how there is extra fabric poking out from the angle of the original bow tie end? Well, tuck that towards the inside, enough to line it up with the outer edges of the bow tie……. Then make a few hand-stitches to keep that tip tucked inside. Repeat with both sides. Now it’s nice and even….without any fabric poking out. Then scrunch the center of the fabric with your fingers and slide your knotted thread through some of the fabric at the center……. Make sure it’s long enough to go around the bow tie, the neck strap, and then have enough to tuck under the raw edges of one end. And un-stitch the end of the old tie a bit. Now lay your bow tie at the center of the neck strap piece with the right sides of both pieces facing up. Then hand-stitch the neck strap to the bow tie at the sides…..right where the winded thread is at the center of the bow tie. Then grab your 5 1/2 inch piece and center it on the bow tie. Then flip it over and hand-stitch one end securely to the back of the neck strap piece. Then pull the other end tight as you wrap it around the center of the bow tie and tuck under the raw end. (Depending on how thick your fabric is, you may have to cut a bit of the end off, so there isn’t so much folded under.) Hand-stitch the folded under section…..securing this center strip in place. And here’s a view from the back. Make sure that your hand-stitched seam ends up at the center back of the bow tie. This keeps everything hidden. Next, you see that one end of your neck strap is the pointy finished end, but the other end is raw. Tuck under the raw end a 1/4 inch, then another 1/4 inch, then sew in place. Then attach some velcro to the back of the pointy end and to the front of the other end……. …………so that you can wrap one end around the other, and secure it shut with the velcro. Hmmmm…..what else can I make for my husband? « New Sponsor and GREAT Giveaway!! OMG!! It's perect and looks like you bought it at the mall!!! My hubby has been talking about getting a bow tie – I am going to surprise him with one! Fathers Day is around the corner, I think I will surprise hubby with one :) Thank you for such a well made tutorial! Genius! I can't wait for the little boy version too! Hi, I have been making some of your stuff this week. I hope to have it up in flick by this week. I was looking for a contact (private-email). But didn't see one. I noticed in this post your husband is in a Pa School. I live in Pa. I use to live in the Philadelphia area, but 3 years ago we moved to central Pa. I am dying here! If you don't mind sharing…Any chance you live near central Pa?? It DOES look nice with a white coat! I wonder if my hubby would like one to wear with his. In addition to looking dapper it seems so much cleaner to me- no long ties dangling near sick patients or other hospital related ickiness. I was already planning a trip to the thrift shop today, they always have a ton of men's ties so maybe I'll pick one up to experiment with! And yes, a perfect gift for Father's day. Or any day! Congrats for this idea! You are a very creative woman. Kisses from Venezuela. Looks great! My hubby is not a fan of bow-ties, but I saw a news story not too long ago about the germs that regular neckties worn by doctors carry, so perhaps that's why your hubby and his buddies are going the bow-tie route. That's awesome! I watched a 20/20 a few months ago on germs. I know, who would watch such a thing…it makes you more paranoid. Some things you just don't want to know, BUT….it said that bow ties are MUCH more sanitary in hospitals than regular ties and that many doctors are changing to bow ties since they don't get in the way or spread germs as much. I just love that it is a throw back to the good old days! This is so great. I love the repurposing and this is great for thrift store ties that might not be perfect. Cannot wait to do this for hubby. He has been hinting about this for some time now. Thank you for the fab tutorial! Thank you thank you thank you!!! I wanted to make a bow tie for my son for a wedding this summer and now I'll make my husband one too. They'll be so cute together! Father's Day is coming! I'd personally love to see some projects for Dad! That way I can surprise my hubs! That's really cute! My hubby is in med school and those guys love bow ties too! Must be a medical profession thing? Anyway I love this idea so much! Thanks! what a fabulous bow tie. it is no longer encouraged or acceptable for doctors to wear ties in the hospitals, they have found that germs can be passed from patient to patient when the tie touches a patient while bending over the patient. I have got to make one (or several) for my hubby since he'll be entering medical school in the fall! I always wanted him to wear a bow tie and now I have more supportive reasons for him besides looking dapper! You rock! We used to go to a doctor that would sort of wear a bowtie. In his picture he had it on, and tied. But out of about 15 visits I never once saw him actually have the bow tie tied! It's a gorgeous bow tie, but why not repurpose into a tie-able tie? They aren't any harder to tie than a regular style. My husband's father had over 3000 ties. When he died, his wife loaded them onto a table and picked out favorites and had a beautiful quilt made. She sent a favorite bow tie to him and he wears it on special occasions. SO cute! I will find a reason to make these…too cute to pass up! My middle boy would LOVE that! I think it would also be cute as a headband (not for my middle boy :)) or on a gift! Thanks! Whoa, that is way cool! And you explain it so well! Thanks so much for the how-to, I'll be linking. I just wanted to say that I am a P.A., and was excited to see your husband is studying to be one! Good luck to him! Wow, you are seriously a crafting/sewing genius! I LOVE everything you share! So, my husband is a PA! He went to school in PA…ha! So, in a year or so if you are interested in working in Family Practice in a rural area in Eastern WA…we could totally hook you up! It is a great clinic, and you are able to get help with your loans(if you need it)…anyway…he loves being a PA. Enjoy school! I really like the bow tie. I can see it working really well as a headband for a little girl with a few minor adjustments! That is so sweet. Super creative! You are so creative! This is going to be perfect for a 50's themed wedding dinner party we are going to! My husband is going as a nerd! What a great idea! It looks really nice on your hubby. Mine wouldn't wear it; but, it might have merit as a hair bow? I'm worried that he's going to have you busy making ties for all the male students…oh for the love of a good and loyal wife. Thanks for this tutorial! Just what I was looking for. What a neat idea. I can't wait to try it. I thought it was just my husband who has started wearing bowties. Who know? AH!!! I'm so making one for Father's Day! Thank you so much for this AWESOME tutorial! I really like this idea! We have a wedding next month and this would look great on both my Campbell guys big and small. THAT IS INSANELY FANTASTIC!!! thanks for the tip and the wonderful tutorial to go along with it. I have several little boys ties that used to be clip-ons, but fell apart. I've been holding onto them hoping to fix them or do something, but now I think I'll make them into bowties. Thanks for the great idea. And I hope your husband is enjoying PA school. My husband is a PA and I remember the school days well. Neil loved this idea!!! He came home and told me how cool Steve's bow tie was. I've actually heard about it several times :) Addison colored on one of his ties in church last week and he was going to just get rid of it, but he told me "Don't worry, Ashley can fix it AND hide the color crayon marks!" Thought you would like this!!! Miss ya! I think it came out great. Thanks for sharing! what a great idea..u r so creative.. Awesome, thanks!! Super easy to make, just made one in about an hour from fabric instead of a tie since I'm making matching suspenders :) I'll post pics when I'm done with the one for my son and the matching suspenders for both. Thanks for a great tutorial! Wow, this is so ingenuous.I think I am gonna make one for my son. Thanks, you are a real inspiration. Great tutorial to make a bow tie. I’ve made 3 and am going to make a 4th today. We wore matching red bow ties for a family portrait. I made one for my fiance, one for my dog and I wore one as a belt. I just don’t see the point of this. You’ve taken what is a very simple accessory — the bow tie — and made it *more* complicated to make by adding velcro tabs and so forth. And you’re putting something on a man that looks fake; a faux tie. Any man who ties his own bow ties will instantly tell that this is fake, and will lose respect for him, just like they would if he was wearing a clip-on necktie. A bow tie is quite easy to make *properly*, and quite easy to tie (it’s the same knot that everyone knows for tying their shoes). Any man practicing tying a bow tie for 15 minutes will have it down for life. And a bow tie that you tie yourself looks natural, organic and artfully disheveled without being sloppy. This is the solution to a problem that doesn’t exist for anyone older than twelve. I just posted about this project here: http://craftsewsweetly.blogspot.com/2012/09/sweet-girls-skirt.html. and probably will post again about it a little more detailed, later. Thanks! This is great. I made my son and me bow ties today. I have many more old neckties to convert. One thing, though. This method makes quite a large bow tie. I am cutting my ties to make them smaller, but the construction steps here are great. I made a tutorial using this one with modifications for little boys baby boys! Hieee i loved the idea and a couple myself and posted this project on my blog as well!! Thank you! Thank you, I’ve been looking everywhere on how to reuse ties or other fabrics to make bow ties. Now someone (me) can finally buy all those thrift store ties and start wearing decorated bowties to class. Great craftsmanship, but sorry – no self-respecting bow tie wearer ever wears a “clip on” (or, “velcro on” as the case may be). Part of the tradition and style in wearing a bow tie is having the ability to actually hand tie a real bow tie. Any 16 year old adolescent going to prom can fasten a pre-tied bow tie. I was excited in my search results because I thought this article was about converting to a real bow tie. In thinking about that, however, I’m guessing that might be more work than your typical DIY’er might be capable of – probably an awful lot of work. Again, great work and article for what it is, but ladies – if your hubby really wants to wear a bow tie, buy them a REAL bow tie with instructions on how to tie it (they can be found in abundance on the Web) and give them some real style mojo. I agree with Jeff. Clip-on’s and hooks are for kids and waiters. Why not go the extra mile and make a real bow-tie. Is there not enough fabric in a neck tie? Les feux sont autoris茅s sur la piste avec un permis de feu disponible 脿 la station foresti猫re locale. Pendant les mois d’hiver, les portes sont ferm茅es en raison des conditions m茅t茅orologiques extr锚mes. Gardez 脿 l’esprit qu’un rythme cardiaque irr茅gulier peut aussi se manifester par des 茅tourdissements, un essoufflement ou la respiration ou des 茅tourdissements. Il ne devrait pas 锚tre utilis茅 comme un substitut 脿 des conseils professionnels, le diagnostic ou le traitement m茅dical. I scoured the web and Pintrest to find how to do this! Of all the tutorials i read, yours was easiest to understand! I just finished up with this bowtie and it looks amazing! I shall have to make another for Fathers day! Thanks so much! Now i have something creative to do with all these plain ties! “I wear bow ties, bow ties are cool.”-11.